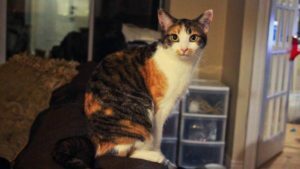 Do Calico Cats Have a Particular Personality? As you all should know by now, we have our own Calico running around our apartment. Now, every time I tell people I have a Calico they always ask me if she has common personality traits to their own Calico… and it made me question… do Calicos actually have a particular personality? Does every Calico act the same or at least similar? What is it that makes them act similarly? Do they know how rare and special they are? While there have been plenty of reports that Calicos are dramatic and filled with personality, there is actually no scientific proof that it is due to their colouring. It is important to remember that Calico is not a breed, however a colouring that can be particularly rare, especially for male cats. Calicos have been rumoured to have a strong-willed, temperamental and fiery personality type. Rumour has it that these personality traits have nothing to do with the breeds that the calicos are, however, have to do specifically with their colouring. It’s also said that Torties or tortoiseshell cats share a similar personality to Calicos. Calicos have also been called stubborn and commonly have difficulties changing foods. Calico cats are also referred to as endearing, sweet, affectionate and warm-hearted. They get into quite a bit of trouble due to their never-ending curiosity and bountiful intelligence. 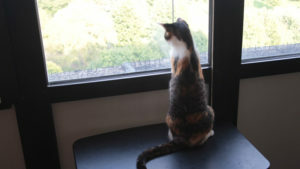 Calicos are usually recommended for families with children, due to their high energy. It’s weird to talk about a cat’s mental health, however different breeds/species do experience different mental health problems such as stress & anxiety. Calicos are actually considered fairly neurotic. This means that it may be very difficult to actually pinpoint your cat’s personality and you’re going to have a harder time trying to get them to do the things you want them to. Some signs of a neurotic cat include “scaredy-cat syndrome“, avoidance of the litter box, excessive grooming/self-mutilation, spraying, hiding, aggression, poor appetite, restlessness, and incessant meowing. Not all Calicos are neurotic and some show only a few of these signs. 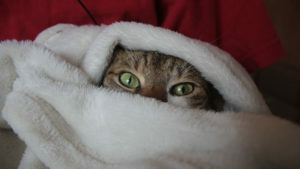 For example, Kalista experiences scaredy-cat syndrome experienced poor appetite and hiding. It’s true that Kalista is a very fiery and independent cat. She has always been very curious and isn’t a huge fan of being cuddled or held unless she asks for it. 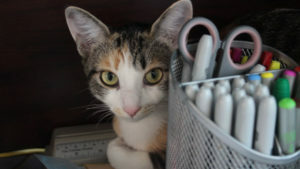 Kalista is very high energy, always wants to play and is rarely found sitting still. She’s the type I joke about being untrainable since she has a huge “catitute.” A few weeks ago I posted a video of Kalista running out of our front door, and I have to say that that’s just one example of something Kalista would do just because she could. No matter how much we scold Kalista, it’s hard to get her to stop her from doing what she wants. Whether it’s scratching our couch, to fighting her brother, to breaking into rooms that are “no-go” zones. (I have to tell you some of the stories of how she’s broken into my closet or even in the room that Gary is in to bother him. On the note of being stubborn, this is very true of Kalista, especially when it comes down to food. If you didn’t already know, we struggled with getting her to eat good quality foods. 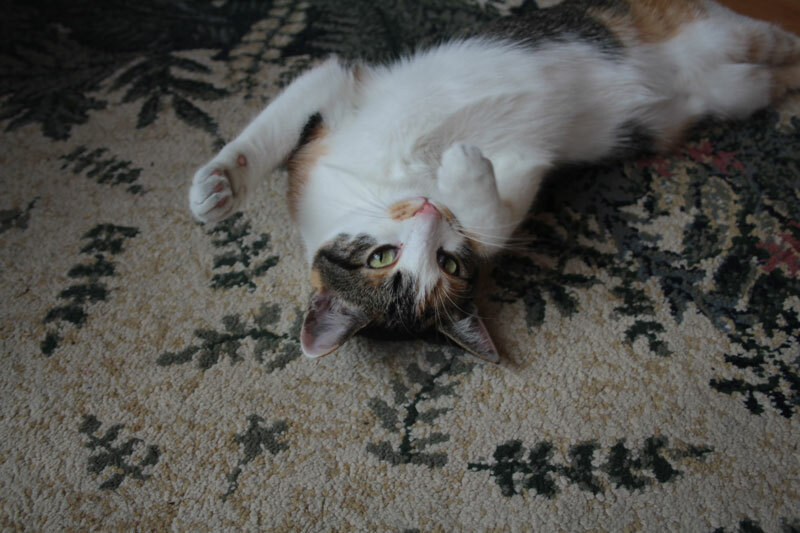 So Pet Parents, I want to know… do you have a Calico? Do they share any of the quirks above? Let me know in the comments below! Tortoiseshell Cats vs Calico Cats? What’s the Difference? Are All Calico Cats Female or Can Male Cats Be Calicos? Mine didn’t have that much of an attitude. However, she had some Siamese in her because of her meow and she had a kink in her tail. She live to be 19 years old. Amazing that she lived till 19! I haven’t had the opportunity to meet a Siamese kitty in real life yet! My Joanie is curious as was my Angel Lucy. Both are/were loving in their own ways.